In 2009’s The Red Tree, Caitlin R. Kiernan gave us something we’d never seen from her before, a first-person ‘found manuscript’ detailing the protagonist’s slow descent into madness. Red Tree is a complexly structured novel—there is a ‘found manuscript’ within the found manuscript of the novel itself, for example—shot through with unsettling bits of Rhode Island folklore. The story ends with Kiernan’s signature lack of concrete resolution. As I wrote in a September 2009 review, “In the end, what the reader gets is not so much a narrative as a bouquet of dark hints, strange moods, and suggestions of the intolerable…. 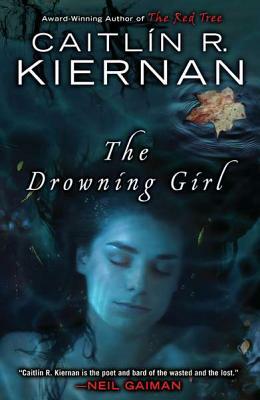 Not only is the evil in The Red Tree not vanquished, it is never clearly defined.” Kiernan’s latest work, The Drowning Girl, bears a superficial resemblance to The Red Tree. While it is also a first person document from a compromised protagonist, The Drowning Girl is more ambitious, more heavily stylized, but ultimately more conventional than its predecessor. India Morgan Phelps—a.k.a. Imp—is a madwoman, a paranoid schizophrenic making a tenuous living as a landscape painter and art store clerk, maintaining her precarious sanity with therapy and medication. Almost simultaneously, two women enter her life, the patient M to F transsexual, Abalyn Armitage, and the manipulative Eva Canning. When the book opens, Imp is alone once more. Abalyn has been driven away and Eva is simply gone. The book itself is Imp’s attempt to record these relationships and their inevitable collision. Complicating matters is Imp’s unreliable memory, which contains two versions of her first meeting with Eva Canning and how that lead to her break-up with Abalyn. As Imp herself makes clear, only one of these versions can be real. In each version of the story, Imp equates Eva with a figure from local folklore. In one memory, Imp identifies Eva with Perishable Shippen, the ghost of a murdered girl that haunts the Blackstone River, pulling unwary bathers to their doom. In the other, Imp sees her as the wandering spirit of the last wolf in Connecticut, a wolf in the shape of a girl. Each version of Eva is also associated with work of a different artist. ‘Mermaid’ Eva may be the source of inspiration for the final, unnerving works of turn of the century painter Phillip George Saltonstall, while ‘Werewolf’ Eva may have played model and muse to the transgressive Albert Perrault. Both men are dead, both in accidents that might not have been accidents. Reading The Drowning Girl is even more challenging than all of this would suggest. Part of the difficulty arises from the haphazard way in which Imp records these two possible pasts. Events are related in no discernible order, the two versions of the story shuffled together like incompatible decks of cards. In addition, Imp is clearly not keen to write about certain things. Her ‘manuscript’ is rife with digressions and semi-relevant tangents. And then there is Imp’s madness. At a certain point, the ‘past’ being described in the manuscript collides with the ‘present’ of its writing, and the impact sends Imp sliding down into paranoid fantasy. Though this section of the novel is thankfully brief, the stylistic devices Kiernan uses to depict Imp’s descent left me doubting my own sanity…. There were, at minimum, two more paragraphs to this review. At least, I think there were. It’s hard to be sure. I wrote this piece in early May. Before I could get it posted to the blog, my hard-drive died. It took a long time to get my computer up and running again. When I finally did, I discovered that the flash drive containing backups of my documents held only a partial version of the review. To be frank, it’s been so long since the original composition of this piece that I no longer remember how it was supposed to end. I’ve tried to recreate it from scratch, but it just didn’t happen. I’m left wondering if I ever really finished it at all. Suffice it to say that one of Imp’s twin realities gathers strength and probability, forcing Imp to confront the event that split her world in two. Readers familiar with Kiernan’s themes and obsessions will not find it difficult to guess what this event is, especially if they have read the pair of short stories on which this book is based. As I said above, for all the wild experimentalism of its execution, The Drowning Girl is, at bottom, strangely conventional. The Drowning Girl is not an easy read. It is Literature with a Capital L. Readers looking for a spooky beach book had best inquire elsewhere. Those who hunger for something rather more substantial, and who are willing to put in the requisite effort, will find much to reward them in these seemingly disjointed pages. As for this review, I think I shall leave it unfinished. The novel is all about uncertainty, after all. The treachery of memory, and the blind spots in our brains we inflict upon ourselves, for the sake of our sanity and survival. In the end, I can’t think of a more fitting tribute to Kiernan’s achievement than this. This entry was posted on July 3, 2012 at 1:43 am and is filed under Book Review with tags Artists & Muses, Caitlin R. Kiernan, Insanity, Mermaids, Rhode Island Folk Lore, Suicide, The Drowning Girl, Werewolves. You can follow any responses to this entry through the RSS 2.0 feed. You can leave a response, or trackback from your own site. Sounds like a challenging read. A bit like a supernatural The Sound and the Fury. Also like how your post, like the novel, ends in uncertainty. Good news. The Drowning Girl is now available in audio form via Audible and the Neil Gaiman Presents series.